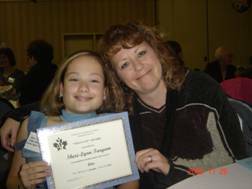 2007 has started out as an exciting year for our Association. In January, we welcomed a new executive director to SBHAC. Nichola Lastella brings both experience and enthusiasm to our National Office. Researchers in Montreal have identified a gene that causes spina bifida. I am very excited to learn more about this at the SBHAC AGM and Conference that will be held in Winnipeg in September. Locally, an announcement was made that a Children’s Hospital will be a reality in Saskatoon ! SBHAS-N AGM held in May was well attended – please see list of Board members and contact them if you have any ideas for our Association. I thank you for allowing me to serve as your President for another year. I was very proud of our Association and the number of families that attended Dr. Griebel’s retirement party. He will certainly be missed. 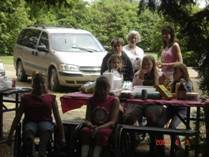 13 th Annual Family Barbeque was held at the Forestry Farm, and despite the dreary weather earlier in the day, the clouds cleared and a fun afternoon with games and a picnic was enjoyed by those who attended, to celebrate Spina Bifida Month. Hope you all enjoy your summer! Federal, provincial and community partners gathered in Saskatoon today to officially open Elm Park Terrace, a new affordable housing complex for low- to moderate-income households, and to announce the construction of another project, Hunter Crossing, for people with disabilities. Low- and modest-income households purchasing homes in either project may be eligible for forgivable loans that are funded by all three levels of government under the Centenary Affordable Housing Program (CAHP). The CAHP is part of Saskatchewan ‘s HomeFirst housing strategy and action plan. The Elm Park Terrace project was undertaken by the Affordable New Home Development Foundation (ANHDF) and Ehrenburg Homes. Located at Avenue K and 29th Street in the Saskatoon neighbourhood of Westmount , the project features eleven modern, efficient and affordable townhouses. The ANHDF is a sponsor of the CAHP – Homeownership Option, which emphasizes the creation of affordable housing and enables eligible low- to moderate-income households to become successful homeowners. Low- to moderate-income families who purchase these townhouses are eligible to access CAHP equity loans of up to $19,500, provided their gross household income is less than $44,500. Working with the North Ridge Development Corporation, the ANHDF is also spearheading the Hunter Crossing demonstration project located in Saskatoon ‘s new Willowgrove area. The 40-unit townhouse condominium project will include 12 fully accessible attached bungalows. The ANHDF is responsible for recruiting applicants and assisting them to obtain both mortgage lending and CAHP loan approvals. To qualify for a CAHP equity loan to purchase one of these housing units, households must have an income of less than $44,500 and have a member of the household with a mobility disability. The ANHDF is a registered non-profit organization that provides education and support to families and individuals who want to buy their first home but, for various reasons, cannot access the traditional marketplace. The organization works closely with various community partners to design, finance and build homes that are affordable and to develop alternative forms of home ownership. CAHP is funded under the Canada – Saskatchewan Affordable Housing Agreement. It provides approximately $33 million in federal funding for affordable housing, matched by Saskatchewan , municipalities and other partners. With these matching contributions, a total of over $66 million will be committed by 2007–08 for affordable housing. Swimming lessons began on April 15 th at the Lawson Heights Pool. The session lasted 8 weeks and cost approximately $3,000.00. However, this year we were fortunate enough to receive a grant from the City of Saskatoon , and we thank them for that. We would also like to thank Shelley Elder for all the hard work and time put into completing the grant application on behalf of our Association. We had 7 members taking part in the lessons. We remind Rural Members to submit receipts to our Board for swimming lessons costs in order to be reimbursed. 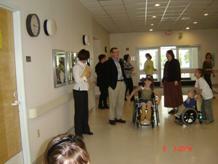 In celebration of Spina Bifida Month goodies were delivered to the June Clinic. Thank you to Nurse Clinician Lynn for organizing our Display Board with photos of our members in healthy activities and displaying pertinent info pamphlets. 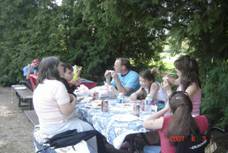 As well, several families braved the short-lived rain to enjoy great fellowship and fun at the Forestry Farm. 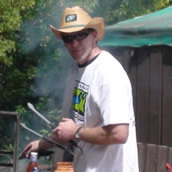 Thanks to Laurel for making the arrangements and thanks to the BBQ Chef – Gene- for the tasty hot dogs and burgers. Research Information: Rerouting Nerves May Aid Bladder Control! WASHINGTON — Needing a wheelchair isn’t always the biggest complaint of people left paralyzed by spinal cord injury — it’s also the loss of bladder control. On Monday, Michigan doctors began a unique experiment to see if rerouting patients’ nerves just might fix that problem. It’s a delicate operation: Surgeons cut open a spot on the spine and sew two normally unrelated nerves together — one from the bladder to one from the thigh — with a single hair-thin stitch. It will take months for this new nerve bridge to heal, an anxious waiting period for the first volunteers. But if it works, merely scratching the thigh should signal the bladder to empty, allowing patients to ditch their despised catheters and restore a longed-for degree of freedom, as well as fewer bladder infections and other serious complications. “I’ve got nothing to lose by doing this,” is the way a cautiously hopeful Kevin Bryant, 19 and paralyzed from the waist down by a car crash, approached the experiment. It’s a technique pioneered in China that is starting to garner international attention — and surgeons at William Beaumont Hospital in Royal Oak , Mich. , hope their new U.S. study will prove if the approach really is a solution for at least some patients. “We’re very excited,” says Dr. Kenneth Peters, Beaumont ‘s urology research chief, who headed a team of doctors that traveled to China last February to watch Dr. Chuan-Gao Xiao operate at the Huazhong University of Science and Technology. Monday’s first volunteer: a 49-year-old paralyzed from a car crash, Kevin Conkey of Fenton , Mich. On Thursday, Bryant, the 19-year-old paraplegic, undergoes the procedure — in addition to a child with spina bifida, an improperly formed spinal cord that can cause similar bladder dysfunction. After infancy, the brain takes over control of urination. The bladder sends “I’m full” signals up the spinal cord. Once the person’s in an appropriate spot, the brain signals back to the bladder to empty. In spinal cord injury and spina bifida, that control is disrupted, leaving patients either unable to urinate or constantly wet. They depend on catheters to empty the bladder every few hours. Still, recurrent infections and even lifethreatening kidney damage from backed-up bladders are common, not to mention the inconvenience and even embarrassment the procedure brings. Xiao’s procedure can’t restore sensation, but uses intact nerves below the spinal injury to try to create a reflex that bypasses the brain. First, surgeons remove a piece of bone alone the lower spine to expose spaghetti-like nerve roots beneath. They reconnect a lumbar nerve responsible for thigh sensation to a sacral nerve that would normally open the bladder. It can take a year, maybe longer, for the two nerves to grow together, and people with certain bladder or spine scarring aren’t candidates. But Xiao says 110 spinal cord injury patients and 230 with spina bifida have undergone the procedure, including two at New York University where he began the research years ago. He has reported a fraction of those cases in respected urology journals, suggesting about 80 percent resume voiding eventually. In the Michigan study, doctors plan to suspend operating after six or eight patients, to resume only once, if, there are signs of success. “As a field, neuroscience is revisiting the adaptive capabilities of the spinal cord below the level of the injury,” agreed Dr. John Martin, a neurobiologist at Columbia University Medical Center — but who cautioned patients to await the research. “Some of these ideas that look good haven’t come to fruition.” There are some risks, Peters cautioned, including general anesthesia and wound infections. For children with spina bifida who can walk, rerouting the thigh nerve causes a small risk of some foot weakness. And it will be expensive, about $30,000 to $40,000 a person, he estimated, a tab Beaumont is funding through a private donor. 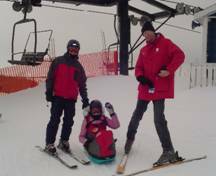 …Dad (Dave) and son(Jonathan Elder) hit the slopes with the Holy Cross High School Ski-trip to Sunshine Village. 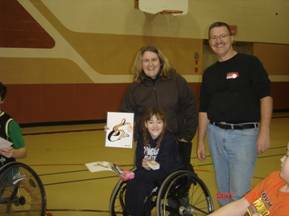 Congratulations to Sheri-Lynn Turgeon, one of the Recipients of the “Yes I Can” Awards from the Saskatchewan Council for Exceptional Children in the area of the “arts-specifically dance” on Sunday, November 26, 2006 . The Mini-basketball team coaches Joelle Buckle and Liam Clancy, along with sponsor Jim Gawluk of Uro Medical Supplies promoted team spirit by challenging team members to create a name and logo for their team. The creative ideas from Chad and Christine were put together in the logo name N.R.G. Both players were quite pleased to receive an i-pod nano for their hard work. The team proudly showed off their team jerseys and warm up shirts at the first interprovincial ‘Best in the West’ Mini-basketball Tournament held in April in Saskatoon . 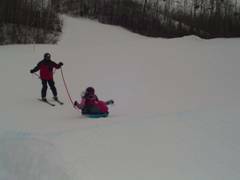 It was a perfect winter to hit the slopes!! Go Christine! Bronze Medal At the Canada Winter Games in Wheelchair Basketball!! 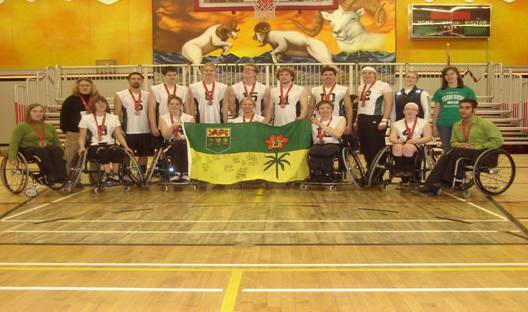 Team Sask made it to the semi-finals and lost 73 – 46 to Team Ontario . They played Team New Brunswick in the bronze match and won 63 – 55. Congratulations to the entire team and to our members: Ashley Baerg, and Duncan Renaut. Congratulations to Michelle Weimer, Co-ordinator/Instructor and Jodi Simpson, Instructor at the University School of Dance, on receiving The Saskatchewan Physiotherapy Association’s Special Recognition Award for their work in Special Needs Dance! 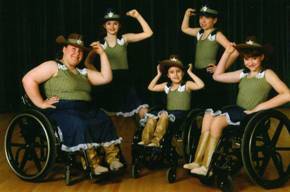 Michelle and Jodi have developed excellent dance programs including the Kids in Motion Junior and Senior Dance Teams. Our children are very fortunate to have such gifted ladies working with them in dance. SBHAC has an enthusiastic and energetic Board of Directors, working on various committees within our association. There is a lot of work being done, which will be reported at our AGM in September. The AGM will be held in Winnipeg , September 28, 29 and 30 at Canad Inns Club Regent Casino. Notification of the meeting, including hotel rates and registration fees, has been sent to all chapters. If you want further information, please phone Laurel at 249-1362 or me, Linda, at 249-0475. This will be a working weekend for all member associations and SBHAC. We will learn about building a national federation as a framework for success for our organization. I hope to see many members of SBHASN at the AGM in September…it promises to be an informative and enjoyable weekend. Farewell to Dr. Griebel ! Dr. Robert Griebel , pediatric neurosurgeon extraordinaire, has been at the Spinal Cord Clinic at the Kinsmen Children’s Centre since the 1980’s. He officially announced his retirement effective June 30, 2007 ! While all of us wish him well, it was with tear-filled eyes, quivering voices and endless words of thanks that many of his “children”, officially said “Good-bye” on June 6 th at KCC. 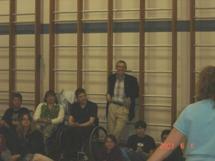 The Farewell Celebration began with a Wheelchair Dance demonstration by both Kids in Motion Dance Teams. It is because of Dr. Griebel’s surgical gift that these young people are able to pursue and develop their gift of dance and they chose to share a special performance just for him. The crowd then moved to the foyer where Dr. Griebel was presented with a beautiful momento from the Spina Bifida Association of Saskatchewan-North in recognition and honour of all he has done for our children and families. Dr. Griebel then shared his thanks and encouragement to the children, adults and parents whom he has become much endeared to. (Yes, more tears!) Several families shared stories and more words of thanks and gifts for him to remember them by. Many hugs were captured on cameras! But, true to the hectic life of a neurosurgeon, when it was time to enjoy the refreshments, his pager went off calling him back to his job for a few more weeks! Dr. Griebel is a man who has touched all of our lives in many different ways. We appreciated his empathetic bedside manner, his words of encouragement, his listening to us, believing in us and his ability to help our children and us understand what we need. Best wishes for a healthy and happy retirement! 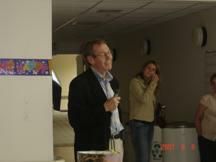 Best Wishes, Lots of Love – – – – – Dr. Griebel – – – – – – – We will never forget you!! Bingo workers make it happen! In the past six months, bingo revenues have been on a continual increase. This money sustains our association, and is used to support all programs and funding requests. We thank all the volunteers who come out to work for us, we couldn’t do it without you. Special thanks to Dave Elder and the students from Holy Cross who used our program as part of their Community Service Hours. We hope to continue this relationship. Keep up the good work! 1) Next Bingo – July 2, 11:30 am – 3:30 pm c all Shawn @ 249-1362 to let him know if you can work or say “YES” when he calls you! 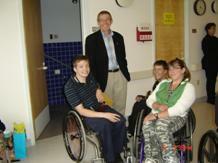 2) SWAD Information( Swimmers with a Disability) call Tom Lefley 384-8616. 3) Notice Of Annual General Meeting – SBHAC The Annual General Meeting of the Spina Bifida and Hydrocephalus Association of Canada will be held in Winnipeg on Saturday, September 29, 2007 . The purpose of the meeting will be to receive annual reports and to determine the SBHAC board members for 2007–2008. See National website for more information www.sbhac.ca . 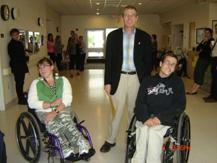 4) The Saskatchewan Abilities Council will operate “Summer Fun” again this year. 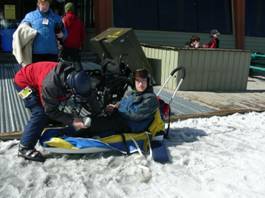 This is a recreation program for children age 6 – 22 who have a physical disability. It starts July 3 rd and runs to August 23 rd . Registration was to be in by June 8 th . 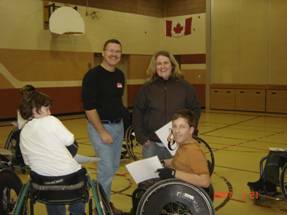 Please call Janine for more information at 664-7207 or email jbaumann@abilitiescouncil.sk.ca . 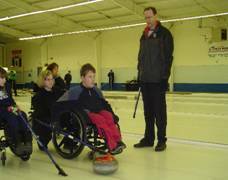 5) The University of Saskatchewan Physical Activity for Active Living (PAAL) program is offered for children and youth ages 5-18 who are visually/hearing impaired, physically/developmentally delayed. Camp runs August 20 th – 24 th . For more information call Jodi or Kim at 966-1003. 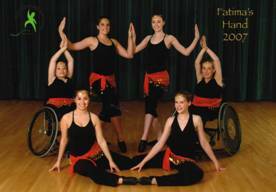 6) The University of Saskatchewan School of Dance is offering it Kids In Motion Dance Camp. 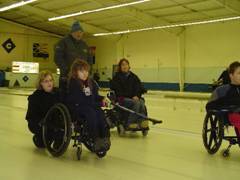 The Camp is designed for children ages 7 – 12 who have mobility impairments and whose primary mode of transportation is the wheelchair. 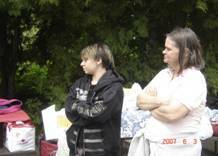 The Camp runs July 3 rd -6 th from 1:00 pm – 4:00 pm . Call 966-1001 for more information. 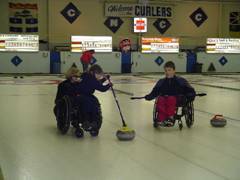 7) The Saskatchewan Wheelchair Sports Association is busy preparing its summer activities. For more information call 975-0824. The Access 2 Entertainment TM card provides free admission (or a significant discount) for support persons accompanying a person with a disability at member movie theatres across Canada . The person with the disability pays regular admission. This program was developed by an advisory group of nine national disability organizations, in conjunction with Cineplex entertainment. We are currently planning a Steak Night for all members, friends and families for the fall of 2007. Stay tuned for more details! Association Membership… Our Association is growing and growing. We need to keep our membership current! As you renew your membership this year, you will receive a membership card with the renewal date on it to serve as a reminder. The membership costs are: $25 per year or $65 for 3 years. With your membership you also are registered with the SBHAC and receive its newsletters as well as our local newsletter, minutes, volunteer opportunities, voting privileges and funding opportunities.